Weighty Matters: World's Best Nasal Product? So let me be very upfront - this post really isn't about a "Weighty Matter". Today I'm blogging about a product I started using a week ago and the results have been so astounding, I feel compelled to write about it. It's called Neilmed's Sinus Rinse and basically it's a squeeze bottle that you fill with warm water, some salt and some baking soda and then squirt it up your nose. I know, it sounds rather vile. I've suffered for years with chronic nasal congestion. Going to bed every night I would sniffle and blow and try to get enough stuff out of my nostrils to be less disturbing to my wonderful wife. I would rarely succeed. 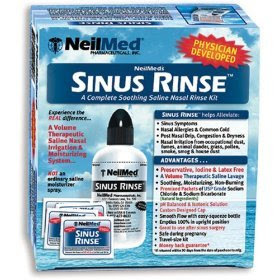 So, desperate I turned to the internet and read about sinus rinsing and found a lot of rave reviews for sinus rinses and neti pots. Now my readers here certainly know, I'm a natural born skeptic, but given how cheap the thing is and that I had nothing to lose, I picked one up from my local pharmacy. Within one day of use my nose was markedly clearer. A week later I'm down to using it only once a day and my nose is clearer than I can literally ever remember it being with our without medication. Now I won't suggest it's a pleasant experience to use, but at the same time, it's certainly not painful. If you've got nasal congestion or allergies, I'd recommend one in a heartbeat. Worst case scenario, you'll be out the $10.49 it sells for on Amazon.com.